….or as most people like to call them, Team CRUUUUUUUZ! The Wildfires vs Team Cruz match-up has become a fan favorite over the years. There’s the undeniable spectacle of Team Cruz: with their Viking war cries and black face paint, everyone in the stands simply gets caught up in the fight for never-ending glory. And then there’s the undeniable All-Star talent Team Cruz brings to San Diego. Maybe you’ve heard of Amanda Jamitinya. Krissy Krash, anyone? 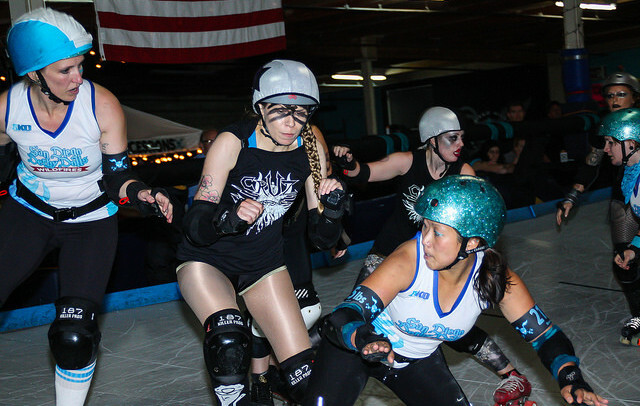 They’ve also enlisted the talent of some familiar names: Vicious Applelicious, D-Cup Runith Ov’r and former San Diego Derby Dolls Tough Soles and Summer Crush. The Wildfires will be bringing the heat with San Diego’s top talent. Gearing up for Battle on the Bank VIII in June, the Wildfires have been tirelessly training together and are ready to defeat Team Cruz. 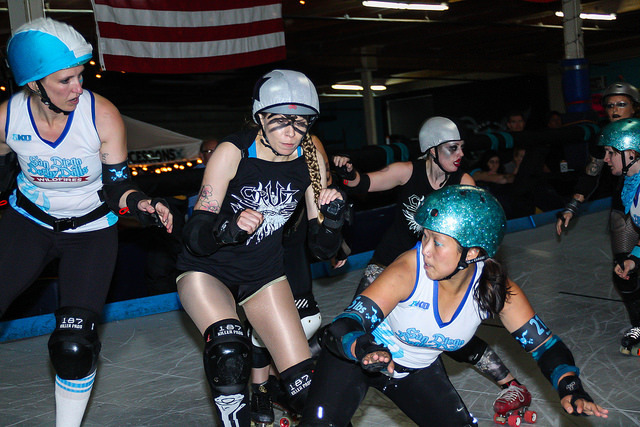 Led by Captains Boo La La and Brazen Bull, the team has developed strong teamwork and communication on the track – something Team Cruz cannot boast. We’ll be looking toward veterans Ballistic Bomber, Hartlyn!, Psycho Brahe, Slamurai and Tsunami to lead the charge this weekend. Doors open at 5:00pm on Saturday and the bout is at 6:00pm. This bout will be held in our private Dollhouse in downtown San Diego, open to only 200 of our closest friends and family. Street parking is free after 6:00pm. Don’t forget to arrive early to check out the newest apparel at our merchandise stand and our vendors in our Vendor Village on the flat track under the disco ball! A concession stand will be full of pizza, popcorn, and soda to satisfy your hunger. All ages are welcome and there is free admission for children 5 and under!